Big news: a new vertical farm just opened in Bedford Park, Illinois, a suburb of Chicago, the current epicenter of vertical farming in the United States. 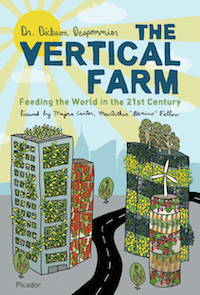 And it’s not just an ordinary vertical farm (if that term can be used at this early stage of this fledgling industry). It’s a really big commercial vertical farm, encompassing some 90,000 sq. ft. of growing space inside a two story-tall, windowless, abandoned warehouse. Called Farmed Here, it is designed to occupy the full extent of the indoor space of that facility – 150,000 sq. ft.! It currently produces oodles of tasty leafy greens (basil, arugula, etc.) and one value-added product, a vinaigrette. What’s more, Farmed Here will eventually employ some 200 people when it finally reaches its full production potential. With that much room to fill up with edible plants, and no outside sunlight to help it along, the energy budget might intimidate faint of heart entrepreneurs, but Farmed Here’s forward-looking CEO, Yolanta Hardej, expects that within just a year from now, her enterprise could be deriving most of its energy needs from composting, generating methane gas. A similar energy scheme will soon be employed by the highly successful vertical farm The Plant, located in the heart of the abandoned stockyards district of Chicago and run by John Edel and colleagues. 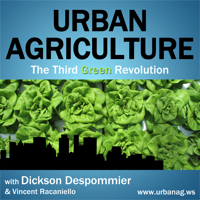 One gets the distinct impression, and correctly so, that the “City With Big Shoulders” is about to burst onto the global scene as a major player in urban sustainability, encouraged by a rising number of urban agricultural initiatives. Chicago’s Mayor Rahm Emanuel has repeatedly endorsed urban agriculture as an integral part of that city’s push for long-term sustainability in several press conferences he has presided over within the past few months. Bloomberg Weekly News in January of 2013 declared that vertical farming would be a sound small business investment for the near future (images.businessweek.com/slideshows/20101105/20-small-businesses-of-the-future#slide20); Yahoo News agrees (http://smallbusiness.yahoo.com/advisor/five-careers-future-031453252.html). A recent workshop I attended in Berlin, organized and sponsored by a branch of the German government exploring the prospects of federal funding for the developmeynt of vertical farms, attests to the fact that some countries (Korea, Japan, China, Germany) are getting wise to the fact that vertical farms may be the answer to many environmental issues, such as a rising atmospheric temperature and an out-of-control climate regime. Meanwhile, back in the U.S. of A., several other new vertical farm initiatives have been announced: “Green Girls” in Memphis, Tennessee, and Green Spirit Farms in New Buffalo, Michigan. Gotham Greens, a commercially successful high-tech 2,000 sq ft. greenhouse operation in Brooklyn, just announced that construction of another facility of theirs has begun (20,000 sq ft), and will be located on top of the new Whole Foods supermarket in the Gowanus section of that same borough of New York City. I can only hope that when that new facility achieves maximum production several years from now, but consumer demand for fresh, local produce still exceeds their capacity to provide for everyone in that neighborhood, then perhaps another floor’s worth of greenhouse will be added to Gotham Greens already existing structures, turning them into true vertical farms! This would naturally lead to the emergence of a friendly competition between The Big Apple and The Second City in promoting vertical farming as an integral part of all urban agricultural initiatives. Onward and upward! Next post: Lets start with ten percent and see what happens next!